It's done and dusted. As usual, I have taken loads of photos, and as such here follows one of those picture posts. Enjoy! Quilting the Fair and Square Quilt went remarkably well and dare I say I think I've got the whole cross-hatching thing down pat. My sewing machine is in fine form, no skipped stitches and beautiful tension, and therefore really nice stitch definition. It does help to have the sewing machine on your side! For the binding I just couldn't go past the white "honeycomb" spot on a black background. It frames the quilt top and coordinates perfectly with the quilt backing. The backing fabric also turned out to be a great choice. The creamy background matches the solid fabric (Kona Cotton - Snow) used predominantly in the quilt top perfectly. This large scale backing print is from the Soiree range by RJR Fabrics (2008). 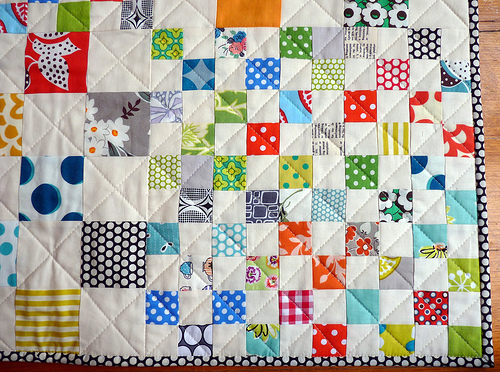 The Fair and Square Quilt is now listed in my Etsy Store. wow - it's so striking! I'd love to see and feel it in person. 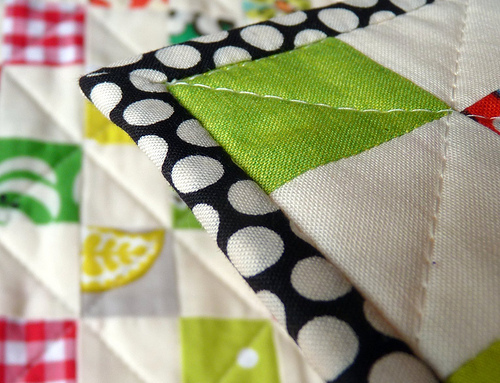 I love the spotted binding and the quilting looks perfect as always. Stunning and that fabric for the binding is perfect. And I really admire your photographic skills too!!! i am a sucker for a polka dot binding! and what is this machine stitching the binding?? i must know more. Beautiful!! 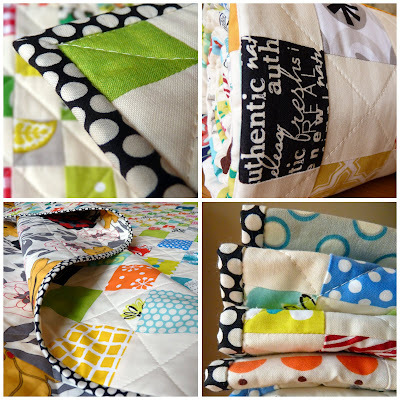 I love the way you did the quilting on it, too! 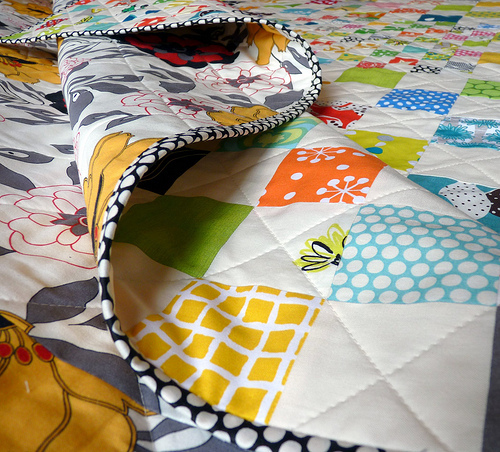 It is so gorgeous Rita...the binding is just perfect and the backing fabric too! absolutely gorgeous! Love everything about this quilt! 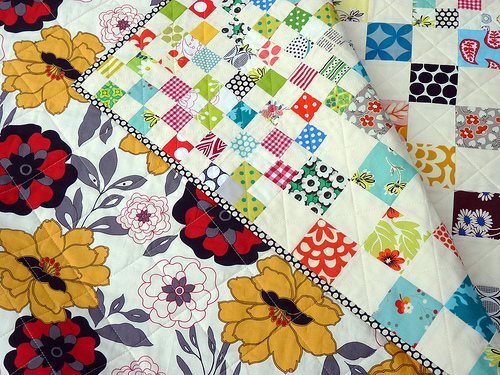 Beautiful quilt Rita, love the polka dot binding and the backing is divine! oh. my. gosh. this is simply stunning. the black polkas are perfection on that binding! Your quilting is so precise. I must dig out my hera marker and try this. Would you mind sharing what your stitch length setting you use? this is gorgeous...i love the large and small blocks! Of course I have been searching for that fabric backing (but no luck)because it is perfect for this quilt, as is the honeycomb binding. Really beautiful work, as usual, Rita! The quilt has such a modern cool twist with the large and small blocks. Love the fabric and binding, too! 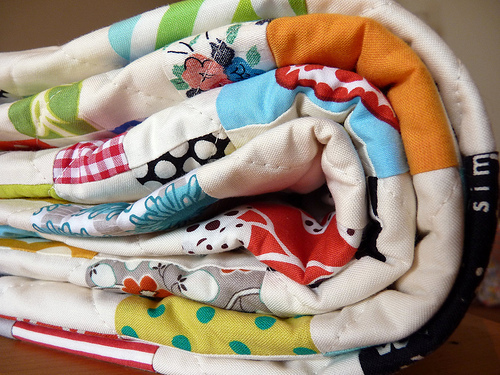 Your quilts are such an inspiration. Rita, you did it again! it is absolutely gorgeous and i have no idea, where you get the patience to stich something beautiful like this up.. just great! This truly is amazing. It is beautiful and that binding is to die for! Love it! Really lovely. 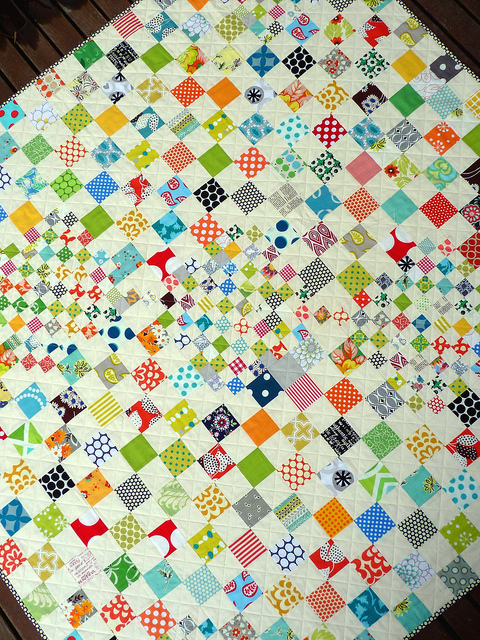 Those large and small square patches really create an optical illusion type quilt. Well done! Love it, backing "sweet", and colors on the front fantastic. Wow, that is just amazing! AMAZING! I have been following your progress on this quilt and I am in absolute AWE that you made such tiny little units. I don't know if I would have the patience...but the top is gorgeous and only wish I wouldn't have to rob a bank to purchase it right now.... GORGEOUS!!! I really love this quilt, it is so beautiful. love the randomness symmetry of the different sized squares. SO simple yet so fabulous and brilliant!!!!!!!!!!!!!! Stunning! And the binding is just perfect. I'm in love with this quilt! The binding really makes it! Beautiful quilt! What fun colors.